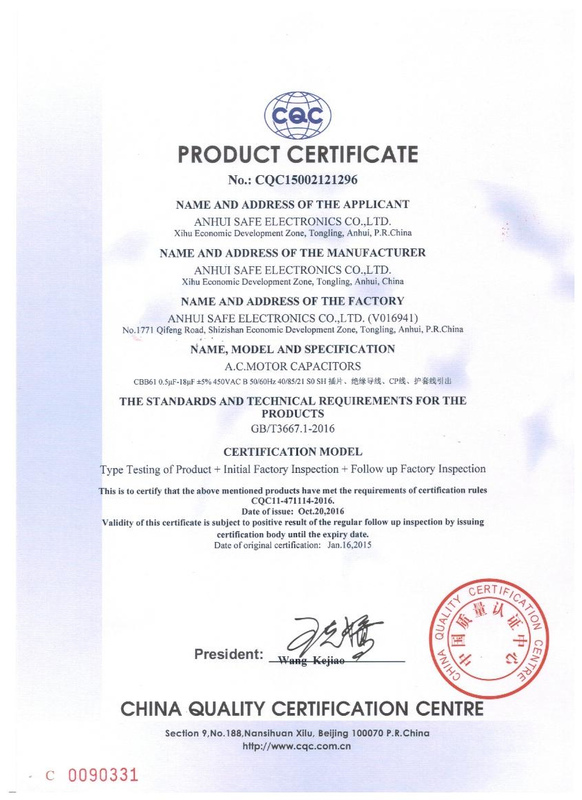 The CBB61 capacitors of Anhui Safe Electronics Co., LTD earned CQC certification - Anhui Safe Electronics Co.,LTD. CQC, a national certificate authority represents China’s accession to Worldwide System for Conformity Testing and Certification of Electrical Equipment of International Electrotechnical Commission. It is also a formal member of The International Certification Network (IQNET) and International Federation of Organic Farm Movements (IFOAM). CQC has earned positive global image through mutual recognition business with well-known foreign certificate authorities and wide international communications. CQC and its affiliates at home and abroad are prestigious certificate authorities which are among the earliest certificate authorities in China. They have gained abundant experience in certificate over past decades and delivered remarkable results in all aspects. CQC has 45 affiliates ,200 cooperative labs around the world and it has signed cooperative agreements with 22 foreign certificate authorities. Besides, it abounds in 7300 workers from professionals, part-time assessors, inspectors to technical experts and it also has excellent teaching resources. In addition, its powerful service network can provide timely, thoughtful and high quality service for customers. According to the Trademark Law issued by Trademark Bureau the trademark registration certificate is a legal paper given to trademark registrant to prove the application situations of the trademark. The main contents of the trademark registration certificate include trademark, trademark registration number, the name and address of the registrant, the approved use of goods or services and their categories and the starting and ending date of the exclusive right of using the trademark.